~ Anethum graveolens (Dill) is an annual herb in the celery family. Here’s how to grow it in the garden and use it in cooking or medicinal remedies. Dill is one of the easiest herbs to grow and would make a great first herb for someone who has never grown herbs before. You’ll find lots of uses for both the fronds and the seeds in the kitchen. A sprig of dill will perk up almost any soup, salad, or main dish. You can buy transplants at your local garden center, but there is no need because dill is easy to grow from seeds. You won’t even have to start them indoors – just plant your dill seeds right in the garden where you want them to grow. Dill likes to be planted in cool weather. In warm winter areas that don’t experience a hard frost, you can plant dill in fall or winter. In cooler areas, plant dill a week or two before your last hard frost. After the first sowing, plant again every 10 days or so for a continuous crop. When growing in containers, use a deep container to accommodate the long roots, and remember that you will eventually have a plant that is three feet tall. Plants grown in containers may require staking. Dill, like most herbs, loves to bask in the sun, but will tolerate afternoon shade. Dill grows up to 3 feet tall, so plant it in the back of your flower, vegetable or herb garden. Sow seeds close together. This will allow the plants, which blow over easily to support each other. Cover the seeds lightly, and allow a week or two for them to germinate. For a continuous crop, sow repeatedly from mid spring to early summer. Don’t plant near caraway, fennel or angelica. Caterpillars are fond of dill, and can be handpicked if they become a nuisance. The best way to use dill is fresh from the garden, so during the growing season, cut your dill to use fresh as you need it. If not kept cut, your dill will go to seed, so cut often until you are ready to switch to seed production. If you find that you have cut more than you can use, dry the excess in the microwave. Spread the dill in a single layer on a paper towel and microwave on high until dry. The result is beautiful and tasty – much better than dried dill you buy in the grocery store. After microwaving, remove and discard the hard stems, crumble the leaves, and store in an airtight container protected from light. Once seed heads begin to form, it’s time to stop cutting dill for fresh use. Allow the seed heads to develop and dry completely, then cut them. You’ll be able to remove the seeds easily with your fingers. 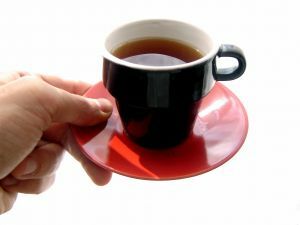 To brew a stomach-soothing tea, use two teaspoons of mashed seeds per cup of boiling water. Steep for ten minutes. Drink up to three cups a day. In a tincture, take 1/2 to 1 teaspoon up to three times a day. To treat colic or gas in children under two, give small amounts of a weak tea. 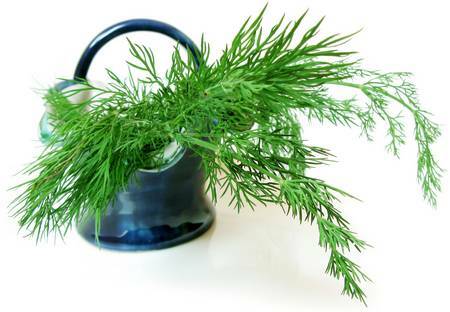 Many herbalists recommend combining dill and fennel to ease colic in infants. The taste of dill leaves resembles that of caraway, while the seeds are pungent and aromatic. Freshly cut, chopped leaves enhance the flavor of dips, herb butter, soups, salads, fish dishes, and salads. The seeds are used in pickling and can also improve the taste of roasts, stews and vegetables. Try grinding the seeds to use as a salt substitute. Both the flowering heads and seeds are used in flavored vinegars and oils. Jackie Carroll is the editor of GardenGuides.com, a leading internet destination for gardening information and ideas.